Eran Bendavid, Patrick Avila and Grant Miller, 2011. Donald Trump a rétabli le Mexico City Policy, qui interdit le financement étranger aux ONG qui offrent des consultations sur l’avortement. 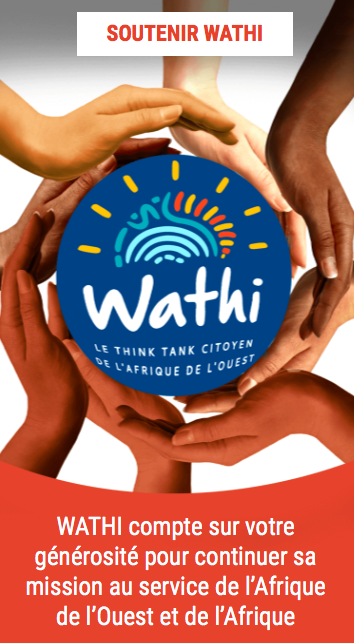 Cela entraine un risque fortuit et probable de hausse des taux d’avortement en Afrique Subsaharienne, comme indiqué par cette étude conduite par WHO. On January 23rd, President Donald Trump responded to the women’s marches around the world with an executive order reinstating the Mexico City Policy. This policy restricts foreign funding to NGO’s abroad offering abortion consultations and procedures. The last time that this policy was under the presidency of George W. Bush in 2001. After the policy’s residence in 2009, WHO published a study determining the potential relationship between the Mexico City Policy’s reinstatement and the probability that a woman in Sub-Saharan Africa would have an abortion. Among these 20 African countries, the study includes 8 ECOWAS nations : Benin, Burkina Faso, Ghana, Guinea, Mali, Nigeria, Senegal, and Sierra Leone. The results of this study determine that health consequences of this reinstated policy, although unintended, are likely. As long as family planning services rely on foreign donation, the Mexico City Policy will negatively affect women in Sub-Saharan Africa as they turn to unsafe methods of pregnancy termination. Between 1994 and 2008, the study compares a country’s subjection to the Mexico City Policy and the rate of abortion. Among 30 standardized surveys in 20 African countries, a total of 261,116 women between the ages 15 and 49 reported their pregnancy outcomes. The study accounted also for changes in modern contraceptive use, as well as age, marital status, place of residency, educational level, and legality of abortion. Results: In countries affected by the Mexico City Policy, women are more than twice as likely to have an abortion than those living in countries where family planning services retain funding. As shown in the figure below, between 1994 and 2001, the mean annual rate of abortions was stable, a mean 13 abortions per 10 000 women. However, from 2002 to 2008, during which time the Mexico City Policy was reinstated, the rate of abortions rose steadily. 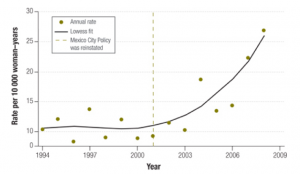 Furthermore, only countries with a high exposure to the Mexico City Policy saw a sharp increase in induced abortions in 2001. 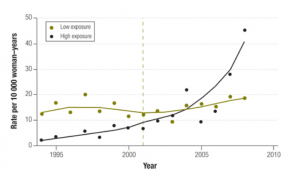 In countries with low exposure to the policy, the rate remained stable. The robust empirical patterns of this study imply that the Mexico City Policy causes an increase in abortion rates across Sub-Saharan countries, and thus creates a reproductive health concern. If family-planning services do not provide modern contraceptive methods, more women will consider abortion as a way to terminate unwanted pregnancies.